Ah my dear friend Shravan Ramaswamy. I had only one regret during this season of Vancouver Fashion Week (VFW), that you and I were unable to get together away from the mayhem and spend some time catching up. 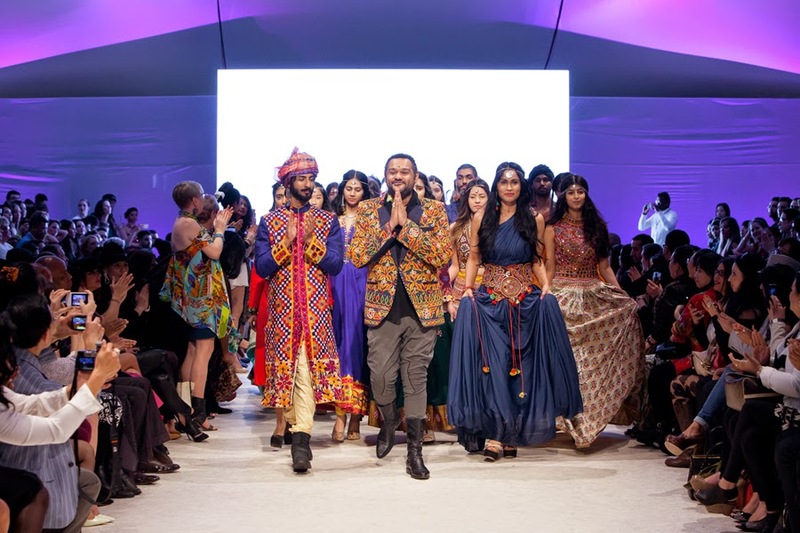 I first met Ramaswamy - talented designer and compassionate humanitarian - a year ago when he brought a collection to the runway at VFW F/W 14 - his first appearance. When he returned the next season for S/S 15, we arranged to meet for breakfast the day after VFW finished. What a privilege it was to sit with an artist and talk without distraction. It was a lovely opportunity to get to know one another better and to record an in-depth interview for my files. I was entranced by his personal journey. But that season he stayed just a little longer. Unfortunately this season he had to leave right away. The 10 hour days of shows and writing don't leave me much free time. Next time come a bit earlier or again stay a day or two longer my friend. Breakfast is on me. I did manage to snag a few minutes backstage with Ramaswamy as he was preparing for his show. A hug is always in order as are new photos together. We were also able to sit and chat for just a few quick minutes about this collection and why it was so dear to his heart. In honour and support, both of my wrists sported gifts from my friend and as the designer took his final bows surround by models, I offered a standing ovation. It was well deserved. This evening, the show began with a beautiful introduction by Selena Sandhu. Sandhu is a local entrepreneur, host and producer at Her Confidence - a web series for women. Decked out in one of Ramaswamy's dresses, she greeted all in attendance and prepared us for what was to come. Next the audience was treated to a passionate dance performance by Canadian Actress Priya Rajaratnam. A teacher at Jess Dance trained in Bharatanatyam, she collaborated with Shravan to highlight his vision/inspiration for this particular collection. The dance she performed was called Guarav Thandavam from which came the Sanskrit word thandra. It was a wild tribute to Lord Shiva who is the almighty power for the tribes of India - the dance of God to take the negative energy away from the crowd and have a peaceful life. Each collection Ramaswamy brings has a different inspiration. F/W 15 was inspired by and in honour of "The Tribes of India." They have a beautiful tradition of art, but they have little money, are very poor and their life is extremely difficult. The designer has been working with the Gujrath, Andhra and Rajasthan tribes for a while now to help open a new world for them and trying to give them a glimpse of a new life. Those watching this evening were offered a window into these people's talent, bringing them recognition here in Vancouver. Shravan shared, "My inspiration is their tribal folk art. There are loads of mirror work to ward off bad omens. The colour palate is natural and very deep - all natural colours from Mother Earth - and bright as the tribes use colour to keep the animals away." When you look at the runway images, several things stand out. There is a joy and celebration apparent in Ramaswamy's collection. No surprise, as I have honestly never seen Shravan without a welcoming smile on his face. We also find a lovely mix of more traditional looks with others offering a more modern style. The tribal elements are still included - but as a more subtle note. The collection featured dresses both short and long and separates for men and women. The wide variety of silhouettes for women meant there was a look each of us could embrace. Then there was the menswear. I am a HUGE fan of Indian menswear. It is bolder, especially in colour and pattern, but ever so masculine at the same time. I particularly loved the purple jacket 2 strips up (accented with the fuchsia scarf) and the longer gold/pink/purple coat in the centre image above. It was also obvious that the models walking the runway loved what they were wearing - something that always makes me sit up and take notice. The show ended as Ramaswamy took his bows surrounded by models showcasing his entire collection. It had to be a proud moment for him. I know as his friend I was honoured to be there sharing this moment. Missed the show? You're in luck Aman Bal of Elite Images has put together this great video with clips behind the scenes as well as the runway presentation. Enjoy!